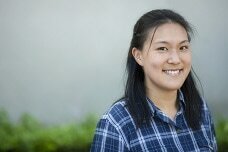 Connie Kang is a Ph.D. student at the University of California, Irvine’s School of Education with a specialization in Educational Policy and Social Context (EPSC). Her research interests include educational inequality, poverty and education, intergenerational transmissions of inequality, and intervention policies. Connie received her B.A. in Economics with a minor in Science and Math Education from the University of California, Berkeley in 2014. She graduated with honors and received distinction within her major following the completion of her senior honors thesis, which examined racial differences in the effect of education on the average duration of unemployment.